At the birth of this project the object was to use up the supplies I have on hand in my studio. The project evolved into much more than that, but the original purpose is still a challenge to be met. It’s been a while since I’ve written about my artistic self-doubt, and feelings of inadequacy due to my lack of artistic schooling. I bring it up again because I am nearing the halfway point in the promise of a year of art. I am roughly two weeks away, and decided to step back a little and check my progress. I have produced a tremendous amount of art since April when this all began. Not all have been pieces that I love or even like. There are some that I am immensely proud of. It is without question the most productive I have ever been artistically. The state of my studio? It pretty much looks the same. I have gone through quite a bit of watercolor paper, several canvases, some drawing paper, but for the most part it looks the same. Which is strange considering that a great deal of my materials have made their way down to our dining room, our family room, our guest room, the kitchen and even the garden. In terms of cleaning out my artistic refrigerator, I am a total failure. I might also mention here that I tend to be a bit untidy as an artist (OK, in other areas as well, particularly when creating in the kitchen), I’m working on it. However, the clutter in my brain is beginning to straighten itself out. Not that I don’t still have total meltdowns and think my work is crap. Years of self-doubt aren’t that easy to shake off. It is just that I am feeling more fearless in my art. I don’t give up when I begin to feel “not good enough” trying to sneak back into my brain. I do have to admit that there are a few recently orphaned canvases that need to be addressed. Oil is still my big hangup. Patience is really in need of attention.I have of course recently professed my new-found love of pen and ink. My watercolor skills are much better than I realized. So as I near that halfway mark I think I’m doing OK. I give myself high marks for growth in artistic confidence, but I am failing in making myself and art a priority. I am still cranking this work out after dinner. That’s right, ninety percent of the work that I have produced and posted on this blog have taken place between the hours of seven and ten at night, including writing. I guess I have to stop and ask myself what the problem is. What is the roadblock in my way? I don’t know. I do know that I can see what I am capable of in three hours, imagine what I could do if I actually gave myself time. I decided to head up to the studio and dig out something different. Pastels. Which I will now admit I am discovering are not my favorite medium. The point is to use up the supplies. I’m trying! This piece is based on a photo from La Jolla Cove here in Southern California. 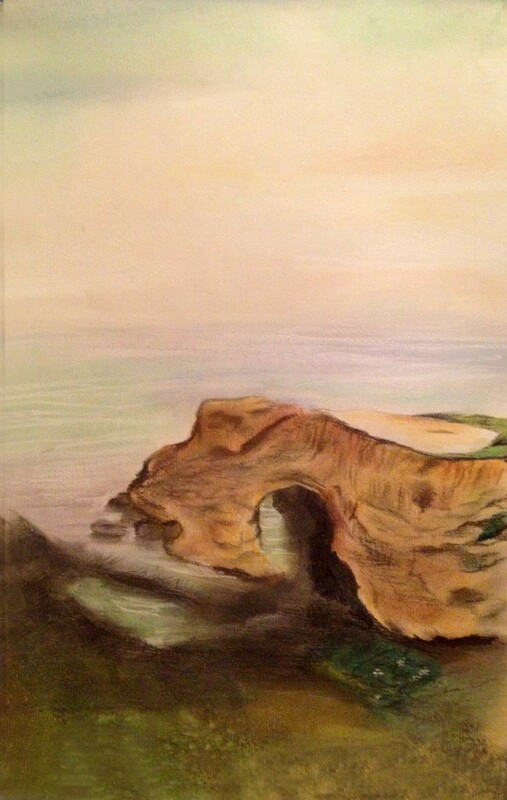 This entry was posted in art, Art and my life, Drawing, Fine Art, Pastels, Uncategorized and tagged art, California, drawing, Fine art, illustration, La Jolla Cove, life, painting, pastels, pencil drawing, projects, self esteem, Southern California, thoughts, Visual arts, writing. Bookmark the permalink.